Kedoshim is a very special Parasha that contains the phrase “Love others as yourself” on which Rabbi Akiva said that is the greatest rule in the Torah. Meaning, it is the rule that all Mitsvot derive from. However, our Parasha is being read during Sefirat HaOmer in which 24 thousands of Rabbi Akiva’s students had died during that time since they did not have respect to each other. The great sages explain that Sefirat HaOmer is not about Rabbi Akiva’s student death. They explain that on Passover each and every one of us should see himself as he is having his own Exodus, an opportunity to be free of our troubles and distress, otherwise we are considered to be slaves that have exemption of all the Mitsvot, since in his condition, the slave is self centered and concentrated only in his problems and has no ability to see the big picture and to fulfill the greatest Mitsva of all – “love others as yourself”. The slave cannot see the pain of his fellowman since his heart is not open. Sefirat HaOmer was designed to teach us what is love and unity, which are a primary condition to receive the Torah on Shavuot. To have respect for each other means to lead to a certain direction, and when we say that Rabbi Akiva’s students did not treat each other with respect it means that they did not share with a whole heart with their friends the power and the knowledge they drew from their Torah’s study. Hence, Kedoshim is always being read on Sefirat HaOmer, in order to remind us it is a time for us to focus on “loves others as yourself”. This way, the way of unconditional we can connect to the flow of the power of the Creator, the power of infinity, into our lives. This power enables real success and blessing in everything we do. This is the power of holiness. Meaning, loving our fellowman is a mean necessity in order to connect to the Creator and to true Success. The Parasha opens with the words “… be holly”. 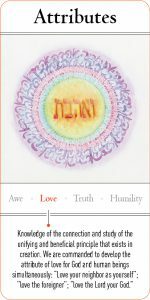 Apparently, it looks like a command, but the Zohar explains that the word “be” has a meaning of a promise rather than a command, that if we behave in a way of “love others…” we will be holly. The Zohar also explains that we do not have to like or love whatever our fellowman does, but we should be able to find the inner spark within him, his divine part, and that part we should love and connect to. That is the only way we could be “holy” – to remember that whenever we feel anger, frustration, jealousy, etc towards our fellowman we need to connect to the divine spark within him.